Boston Red Sox to Host Houston Astros as Baseball’s Two Best Teams Collide on ESPN Sunday Night Baseball September 9 - ESPN Press Room U.S. The Boston Red Sox and American League batting leader Mookie Betts will host the defending World Series Champion Houston Astros and All-Star Game M.V.P. Alex Bregman on the September 9 edition of ESPN Sunday Night Baseball presented by Taco Bell at 8 p.m. ET. Entering play on August 7, the Red Sox and Astros have the two best records in Major League Baseball as the Red Sox currently sit atop the American League East at 79-34, while the Astros lead the American League West at 72-42. Sunday Night Baseball presented by Taco Bell airs on ESPN and the ESPN App with Matt Vasgersian, analysts Alex Rodriguez and Jessica Mendoza, and reporter Buster Olney providing commentary. Sunday Night Baseball also airs on ESPN Radio with Jon “Boog” Sciambi and analyst Chris Singleton describing the action. Audio from the ESPN Radio broadcast is available on the ESPN App. Sunday Night Baseball is also available in Spanish on ESPN Deportes and ESPN Deportes Radio. Baseball Tonight: Sunday Night Countdown presented by Chevrolet will precede Sunday Night Baseball with a one-hour pre-game show starting at 7 p.m. on ESPN. Karl Ravech is joined by analysts Mark Teixeira, David Ross and Tim Kurkjian for most episodes. ESPN is coming off its most-watched Sunday Night Baseball telecast in four years, since 2014, according to Nielsen. The August 5 telecast, which featured a stunning comeback victory for the Boston Red Sox over the New York Yankees, generated an average of 2,746,000 viewers, which was up 71 percent vs. last year’s comparable game – 1,605,000 viewers for New York Mets vs. Los Angeles Dodgers. On deck: the National League West-leading Chicago Cubs and Javier Baez will host the Washington Nationals and Bryce Harper on the August 12 edition of Sunday Night Baseball presented by Taco Bell. 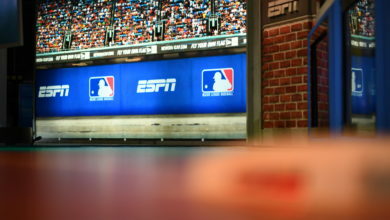 On August 19, ESPN will televise the second MLB Little League Classic presented by GEICO, held in Williamsport, Pa., the site of the Little League World Series. The Philadelphia Phillies will host the New York Mets.